Majora’s Mask was a Zelda game that I was genuinely excited and hyped for back in the day. I first heard about this title not long after finally completing Ocarina of Time (OoT) and I remember following its development in gaming magazines and getting more and more pumped. The problem was, the game just took far too long to come out. So long that it released over a period where I personally didn’t have time for much gaming. A few years later when I started getting back into the N64 library it was a little too late. 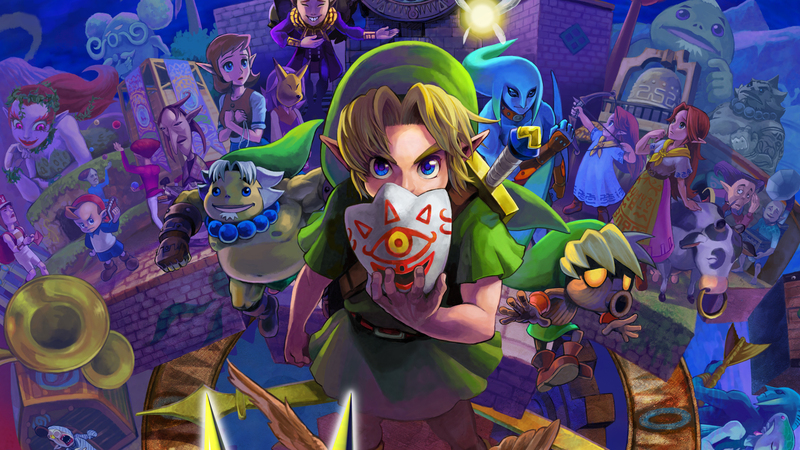 Majora’s Mask had come and gone very quickly in a smaller print run and copies went for crazy prices. Fast forward to this year and I hear that it’s coming to the 3DS. Yes, we all knew this would happen after OoT was released so close to the launch of the system, but as soon as I knew Majora’s Mask was on the way I knew I was in day one so as not to miss out a second time. Young Link, fresh off of saving the world in OoT, is on another quest for adventure when he bumps into a skull kid in a suspicious mask. 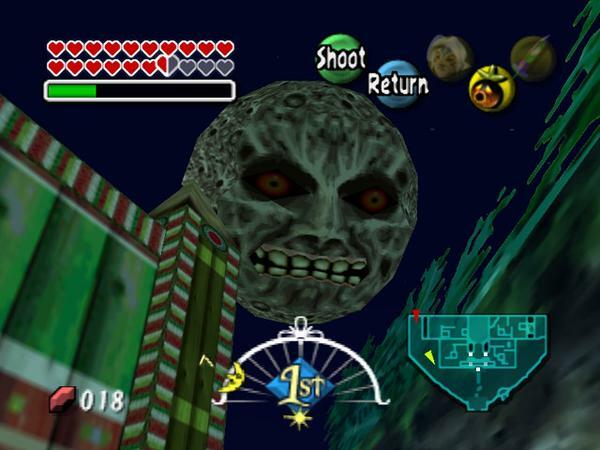 He turns Link into a Deku kid and the race is on to pursue the bugger only to find he is going to get the moon to crash into the world in three days. During these first three in-game days I generally felt very anxious and in a rush to figure out what to do. The game does a excellent job of hitting home that a threat is looming over you. The game will remind you with stern black screen and white subtitles how much time remains and in case that wasn’t enough of a threat for you, just look to the sky and you will literally see the most horrific moon gradually descending. Then the tension builds to its highest level when you have just six hours remaining and a timer will gradually count down. When this first happened I thought my game was over and I’d failed. But fortunately I ‘d reached the point the game wanted me to get to and I discovered you were able to rewind to the first of the three day cycle. So in a way the story turned into Live. Die. Repeat (aka Edge of Tomorrow): Zelda Edition. Once I returned to the first day I had the biggest moment of relief that I think I’ve ever had in gaming. And so begins the quest to save the world, again. Once you reset the cycle you have another three days (in-game time) to concentrate on the main quest or indulge in the side quests. If you focus only on the main quest it really won’t take you too long. There’s only four dungeons in this game when compared to the other Zelda titles, but the real meat of the experience comes from exploration and getting stuck into the side quests. You will soon discover that certain events will only occur at certain times during the three days cycle, even though the 3DS notes down these events on a little schedule to follow it still felt like a game where you need to have a note pad handy and that’s kinda cool. When you rewind time to the dawn of the first day again you keep any major items collected but any progress you made in the quests and the dungeons, as well as any loose items like bombs and money you collected is lost. This leads to a lot of repetition as you’ll need to repeat quests and dungeons over and over in order to complete certain side quests. The three day time limit also doesn’t stop in the dungeons, so you don’t really have a lot of time to complete those typically head scratching Zelda dungeons. For some dungeons I had to rewind time twice as I had not mastered the correct route. This won’t be a problem for everyone but for a Zelda noob like me who usually takes his time in dungeons, this is a pain in the backside. The good news is once you reach the boss area you do get a short cut warp at the start of the dungeon saves a lot of time. Not only that but you’ll also find out a way quite early into the game to extend the time you have available, ideal for slow pokes like me. 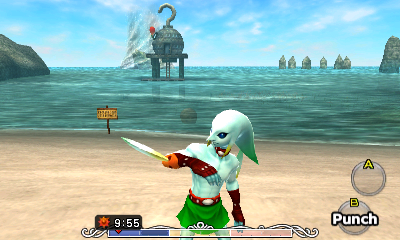 The main hook of this Zelda game is the masks. There are a lot to collect all of which give Link some special power such as exploding like a bomb or getting access to exclusive areas. Most masks only require you to use them once to complete certain side quests but it is a ton of fun trying to collect all of them. There are a few masks which will literally transform Link into a Zora, Goron, or Deku Seed Kid and these literally change the way Link plays. 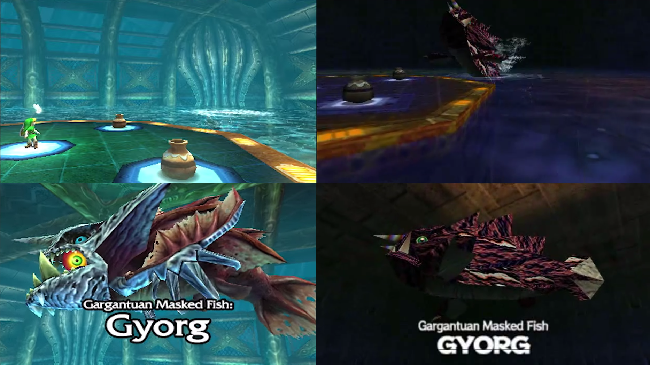 These transformations are a ton of fun and really make the game shine out from the other Zelda games. Also just like other Zelda games, this really is an epic adventure. You’ll visit varied environments you need to fix, meet a whole ton of colourful characters, and you even get those warm fuzzy feelings when you fix an area and bring happiness to someone in peril. 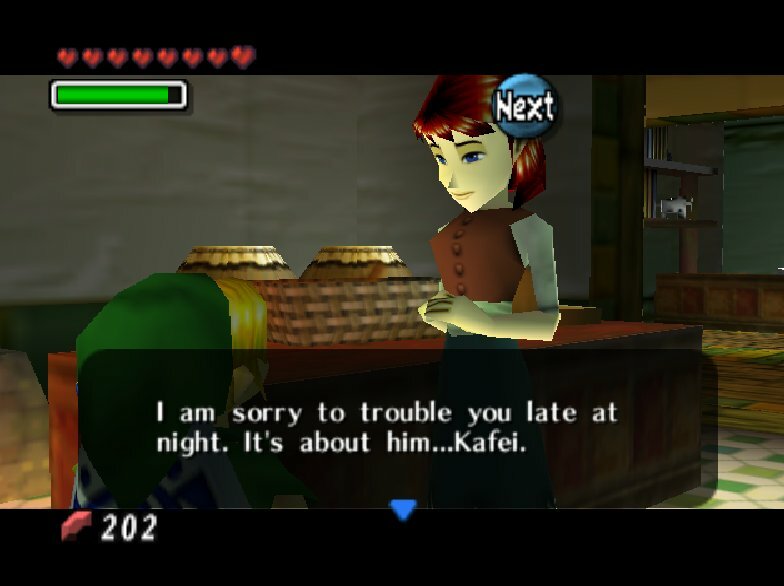 Unlike the other Zelda games though, your heart is then broken because you have to rewind time and all those nice things you did for people are erased. The music is pretty fantastic. I still love those familiar Zelda noises. Those chimes of victory when you defeat a boss, to the sound the treasure makes when you open it, these moments never get old. The soundtrack shares a lot of the music from OoT which is to be expected. 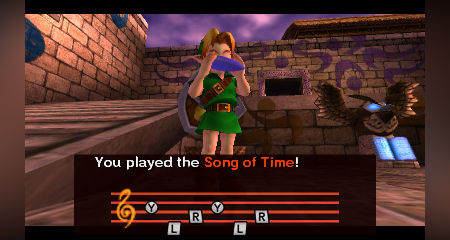 Overall, Majora’s Mask surprised me. It was a game that I really didn’t warm to from the start but the more I played it the more I just started to enjoy it. Some of the side quests are surprisingly heart felt and when I finally completed the main quest after constantly rewinding time I was presented with a screen that just made me feel so relieved and happy. It’s not surprising that not everyone enjoys this game as it’s really very different from other Zelda titles. But here it’s an experiment that has really payed off for the developers and it is a title that I will absolutely cherish until the moon crashes into the Earth – and then I’ll just rewind time again. I am one of “those” controversial Legend of Zelda fans. I don’t particularly like that A Link to the Past was a re-hash of the original, although I truly did love that game, and by the time Ocarina of Time (OoT) came out and I read the reviews that revealed it was basically another re-hash only this time in 3D and I couldn’t bring myself to play it. This mentality continues even today, which is why I felt it necessary to explain myself before I go into why I appreciate Majora’s Mask much more than most of the other Zelda titles, even if I don’t think it’s mechanically better. I should also point out that my first time with OoT was the 3DS re-release and my first time with this title was last month, so I am in a unique position to bring no nostalgia to the table (although our Top 10 N64 games clearly reveals that I do have a soft spot for OoT despite this fact). Majora’s Mask is an experiment that a few other creative people I appreciate have done before and I continue to be fascinated with each instance of it happening. The fact that it is so profoundly entwined with OoT also makes it hard to talk about one without the other. In the end, Majora’s Mask is a contemporary RPG that was understandably questioned and misunderstood with the mainstream of the year 2000, but it fits right at home with the likes of today’s titles. There were two books I read back-to-back in 1996 thanks to my favorite author of the time, Stephen King. Those books were The Regulators by Richard Bachman and Desperation by King himself. The idea that these books were written by two men is a misnomer, King had used Bachman as a pen name in the past and resurrected him for this little experiment. The books tell two different tales that take place in two different locations with completely different plots, however the characters and core concepts of both books remain the same. It was referred to at the time as “mirroring works” and demonstrates that with the right cast you can create two different works even if the assets remain the same. Ocarina of Time and Majora’s Mask fall under this very same concept and much like the sales result of Desperation and The Regulators, it’s no shock to me that the traditional formula sold much better. Interestingly enough, there’s no denying that Majora’s Mask is not only more unique and creative, but it also looks a hell of a lot better thanks to the two extra years of development with the same engine and assets. At the same time, it’s a drastic removal from the safe environment of a Zelda title that doesn’t feature Hyrule, Zelda, Gannon, and revolves more about side stories than the main quest and dungeons. While the actual roots of Majora’s Mask are somewhat elusive thanks to Nintendo’s tight seal, some part of this title started life as Legend of Zelda Gaiden, or side story, which even further backs the general focus of events happening on the sidelines. It can be daunting to try this game, especially if you’ve never played it because you hear all these things about the game that are discouraging. A 72-hour in-game timeline seems so closed and not respectful of the player’s time, however as Jam points out the game is very good at keeping track of this time for you and reminding you when anything critical is about to happen that could stifle your progress. Pausing the game will stop the clock, as will any time you navigate menus, talk to people, and there’s a versatile save system in place even for the N64 version (which is the one I played) even though it’s much better in the enhanced 3DS re-release. If you’re going back to the N64 original there are some quick hitches, like the fact that you probably want to have a notepad by you – I surely needed it – and it doesn’t help that you cannot play this gorgeous example of what the N64 can do graphically unless you have the necessary expansion pack. Still, what you get in return is a gem of a title that kept me addicted night after night this entire month as I struggled to get in all massive 35 hours of content before the deadline I couldn’t affect, our game club, loomed overhead. The time limit and schedules of the game are frankly no big deal and if you go into it with a guide, which I recommend, you can take a lot out of this vast adventure with so many side plots that you have to see them all. 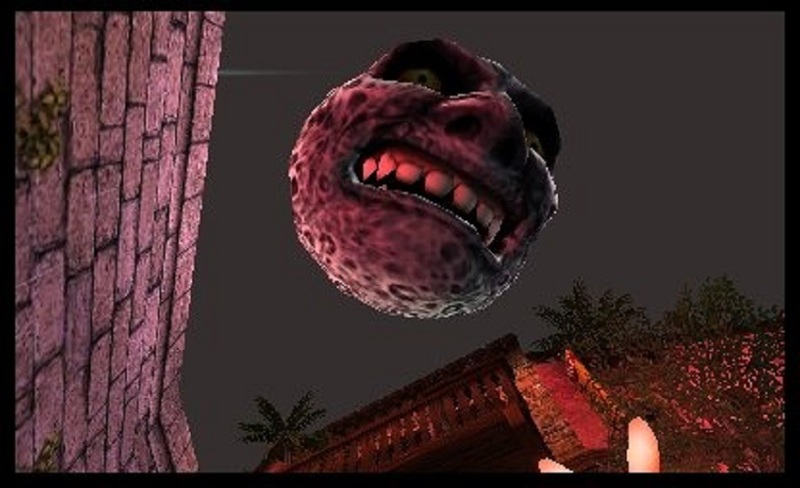 Also for anyone who knows that Majora’s Mask uses the assets and engine from Ocarina and fear the games will be too similar, nothing could be further from the truth in both a setting and plot perspective. This is a fresh new game that breaks the mold and should be commended for it. That’s not to say I don’t have my gripes. 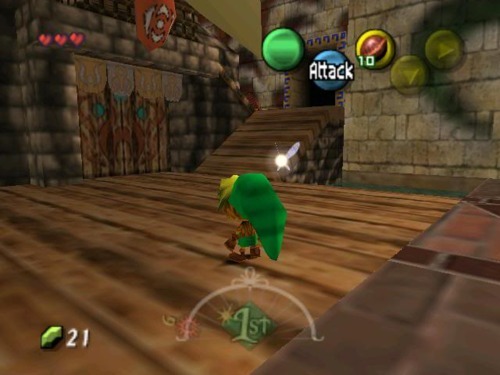 I hated taking on the dungeons, especially the final two (your order is forced by the items you collect much like other Zelda games) where I was burning the midnight oil on day three before getting out. Granted, I didn’t use a guide to figure out what to do and both dungeons has you solving puzzles to navigate them. You can tell the developers even had trouble because the puzzles were easy but time consuming in the water temple only to throw you in with a brutal boss, whereas the brain twisting stone temple had a pathetically easy boss awaiting the end of your journey. Worst of all, you have to waste a lot of time (both real and in-game) if you want to quit while tackling these dungeons, so I had to find a good 2-3 hour block and get completely prepared the day before my “temple run” nights so that I wouldn’t have to save mid dungeon. That makes the convenience and enhancements, not to mention portability, of the 3DS version tempting. It’s not just the main quest and dungeons, either. Certain side quests, especially the lover’s story and milk story (cryptically named on purpose) have tight schedules and the N64 version only lets you skip ahead to either dawn or nightfall of each day so you will be spending time waiting around for an event to happen – I personally read a book. This is very much a lack of respect for the player’s time, which again was remedied in the 3DS version (you can skip ahead on the hour), but it’s not very common and completely optional. I also find it hilarious how even six years into development and four years into release of the N64 that programmers were still creating challenges and mini games as if the player were using a precision d-pad, which you are not allowed to use in this game despite the controller having one, and instead using an analog stick. That makes tasks like hitting moving targets or rolling a character in a straight line difficult enough as is, now imagine it on the lackluster N64 analog nub and after 20 years of use. Frankly, I’m shocked I was able to beat the game at all. Finally I have to attack the fact that this game gives you absolutely no direction in its original form to the point that I cannot imagine how a player could just be dropped in and complete the game 100 percent without dedicating twice the time I did and possibly getting into triple digits of hours. While I find the charm and attributes of the original the ideal way to play this game (I did not like the visual tweaks made to the 3DS version), I can’t imagine touching the original without a guide (plug: we have a link to a fantastic one on this game’s profile page). That’s probably why my score is lower than Jam’s, because he played the 3DS version that addresses all of these issues, but for better or worse my stubbornness is going to hurt this game’s score. Despite all of these setbacks I have to say that I haven’t been so enchanted by a game of this era for a long time and that I never imagined I would have a smile on my face and an addiction in my veins from start to finish of Majora’s Mask. 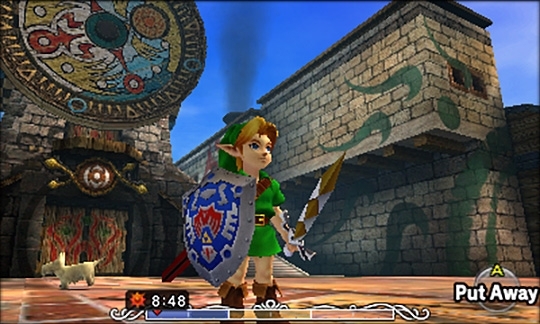 Not only was this entire concept unique for Zelda games of the time, but it was also quite unique for most games of this time altogether, especially as an RPG that was action-based when most others were turn based (or active time battle). I see why it has grown popularity today because beloved titles like Skyrim, Mass Effect, and even Persona are all about the crazy and creative side stories that divert you from the main quest. As a gaming culture we have demonstrated that we are willing to deal with a so-so main quest as long as there are plenty of squirrels to divert our attention, especially if they are entertaining. 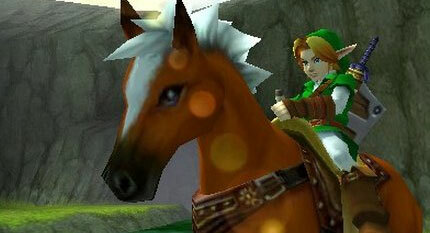 Dare I say Majora’s Mask is Red Dead Redemption way before it was mainstream? Okay that may be overselling it a bit, but if you’ve been waiting for a good time to attempt this one-off I can’t recommend it more. While I may be done with the title for at least a decade or two now that I’ve completed it in full (all main and side quests plus all items collected), it was a hell of a month in three day intervals. It is important to note that our reviewers played different versions. Jam completed this title in full on the 3DS console and took approximately 30 hours to complete every quest. Fred chose to play this game on an original N64 console with an original Version 1.00 cart (expansion pack installed, of course) and took 35 hours or more to complete. Looking for information on the game’s release, value, or even a guide to get through it? Check out our profile page.